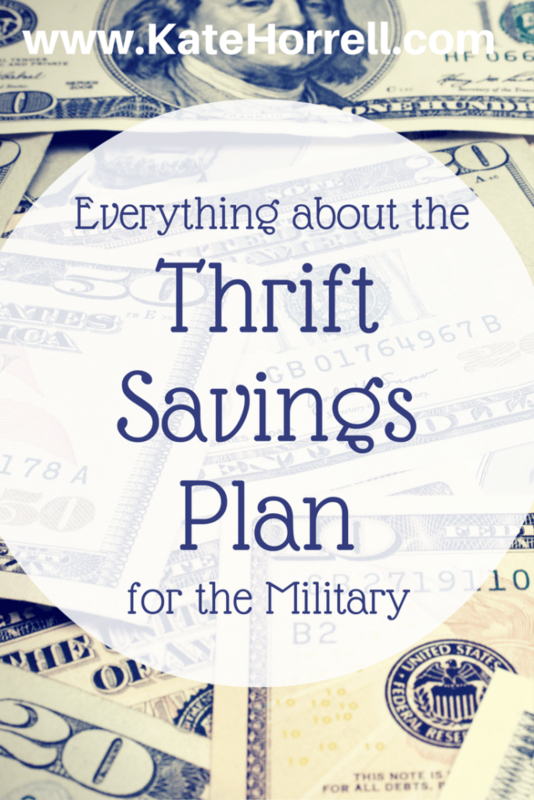 If you’re in the military, you’ve probably heard about the Thrift Savings Plan (TSP). Heck, you may even contribute to it. But what is it, how does it work, and why should you contribute? TSP is the government’s user contribution retirement savings account similar to a private employer’s 401(k) account. Military members and government civilians contribute money directly from their paychecks into their TSP retirement savings accounts. TSP is a simple, convenient, and inexpensive way to build your retirement portfolio in a tax-advantaged retirement program. In addition, the 2012 introduction of the Roth TSP accounts provide more options for savers to reach their retirement goals. The money can be invested in different funds, and (hopefully) grows in value. Withdrawals, called distributions, are subject to a variety of limits and rules. Why Should I Contribute To TSP? How Do I Sign Up for TSP? What Happens To The Money? What If I’m In A Tax-Exempt Combat Zone? How Much Should I Contribute? How Do I Start Saving? Thrift Savings Plan Funds: Which One Is Right For You? How and When Do I Get My Money Out? What If I Need My Money Before I Reach Retirement Age? Do you want to know more about your military pay and benefits? Most people will stop working for income eventually, either because they choose to retire or because they become unable to work. Contributing to a TSP account gives you more choices in the future, when you can convert your account balance into an annuity for a lifetime income stream, cash in your account for a lump sum payment, or take a series of payments over a selected time period. You can even do a combination of them, perhaps taking a lump sum to pay off your mortgage and then converting the remaining balance into an annuity. Most military service members will not qualify for retirement pay unless they remain in the service for at least 20 years. Your TSP account remains yours, whether you get out after one four-year enlistment or suddenly decide to resign at 19 ½ years. which fund you want to purchase. Once you’ve figured out those issues, the actual signing up part is easy-peasy. TSP has nine different funds into which you can put your money, plus one fund that holds the account balance for people who are already receiving distributions. You purchase shares of these funds. The funds then invest that money according to the objectives of the fund. There are five single funds with a range of risk and volatility. There are also five Lifecycle funds that each owns a selection of the other funds, particularly balanced for your selected estimated retirement date. You can put your entire contribution into one fund, or split it up between multiple funds. Once you’ve decided to open a Thrift Savings Plan (TSP) account, you have to choose between a traditional TSP account, and a new Roth TSP account. The main difference between these two accounts is when you pay taxes. If you are familiar with traditional and Roth Individual Retirement Arrangements (IRAS), you already have a head start on understanding the differences between the traditional and Roth TSP accounts. With a traditional account, money is contributed to your TSP account before you pay income taxes. This reduces your taxable income in the year that the money is contributed. Money grows in your account, and you will pay taxes on the contributions and your earnings when you take money out of the account. This is a better choice for you if you have some reason to anticipate that you will be in a lower tax bracket during retirement. This might also be a good choice if you think that our country is going to decrease its income tax rates. With a Roth account, money is contributed to your TSP account after you pay income taxes. Distributions, including both the contributions and the earnings, are tax free if five years have passed since 1 January of the year in which you made your first Roth TSP contributions, AND you are 59 1/2 years or older, disabled, or deceased. Tax free income is almost always a good thing. Which account is right for you? That depends on a number of factors, including your tax bracket now, your anticipated tax bracket in retirement, and what you think is going to happen to our country’s tax structure in the future. Don’t forget that that you can also choose to put a portion into each account, although the math gets a little trickier. Most military folks feel that a Roth TSP is a better choice long-term. Yes, you will pay more income tax now, but all distributions are tax free. I’ve not yet heard anyone say, “Gee, I wish I hadn’t paid those taxes before.” If you are currently paying little to no federal income tax due to low income, choosing a Roth TSP account is more obvious. No taxes now, no taxes later. It is truly the only way to have completely tax free income. Money earned while in a Combat Zone Tax Exempt location receive special treatment when contributed to either a traditional or Roth IRA. Distributions of tax-exempt contributions are always exempt from federal taxation, but the distribution of earnings on these contributions may be taxable. The earnings from the tax-exempt contributions to a traditional TSP account will be taxed at distribution. The earnings from tax-exempt contributions to a Roth TSP account will remain tax-free at distribution, provided you’ve met the rules as listed above. Understanding the differences between a traditional TSP account and a Roth TSP account allows you to make the best decision for your particular situation. If you absolutely can’t decide, I recommend choosing a Roth account and moving forward. You can always change the allocations of any future contributions if you change your mind. Don’t let this decision keep you from contributing to a TSP account. When it comes to the amount that you contribute to your Thrift Savings Plan account, there are two issues: the federal government’s TSP contribution limits, and how much you feel you can contribute. Both are important parts of the equation, and understanding them both will help you to make an overall plan for contributions during your time in the service. Federal law limits contributions to tax-deferred savings accounts like TSP. For 2018,the regular contribution limit is $18,500. This limit is for taxable income, including base pay, incentive pay, special pay, and bonus pay. This limit is called the elective deferral limit. There are special rules for non-taxable income, such as income earned while in a tax-exempt combat zone. For 2018, you can have contribution total of $54,000 if everything in excess of the elective deferral limit comes from taxable income. This limit is called the annual addition limit or I.R.C. Section 415(c) limit. There are some tricky bits of the tax code as it applies to contributions that exceed the elective deferral limit and enter into the annual addition limit area – be sure to get good advice when making these contributions, or read my friend Doug’s explanations here: Maximizing Your Thrift Savings Plan Contributions In A Combat Zone. The short answer is: as much as you can. However, different situations require different strategies. In figuring your total contributions, I want you to look way beyond your current situation and look into the future. How much money would you like to have saved by the time you separate from the service? I think this is one aspect of TSP planning that is very different from any other retirement planning. Unlike Individual Retirement Arrangement (IRA) planning, you can’t count on decades of contributions. You can only contribute to your TSP account while you are serving, or if you move to a government position. For most of us, that means 4 or 8 or 20 years of contributions, not 30 or 40. That makes a big difference. Even if you think you know how long you will remain in the service, there is always the possibility that an injury, a drawdown, or some other surprise could cut your military service short. This is why I really encourage members to save as much as they can manage from the very beginning of your career. Once you are looking at the big picture, you can make smart decisions about timing your contributions to take advantage of tax-free pay and other issues. No matter how you cut it, more is always better. One important thing to remember about TSP contributions is that you can change them regularly and easily via MyPay. That is why I encourage people to aim high when planning their TSP deductions – you can always lower them if you just can’t possibly manage with the amount you planned. You can make changes as frequently as you want, always considering the contribution limits listed above. Contributing is always good, contributing more is always better, and making thoughtful decisions that look at the big picture is the best. Consider carefully how many years you might have to contribute, the likelihood that your timeline will be cut short, and how you can maximize any potential tax-free contributions and increased contribution limits for tax-free amounts. Most of all, just save! There are a variety of factors to consider when selecting a fund for your TSP investments. You need to consider your tolerance for risk, and also look at your entire financial picture. Every investment carries a level of potential gains, and a level of potential losses. The balance between those two is defined as its level of risk. Investments with little potential for loss, but also smaller potential for gain, are considered very safe. Investments with huge potential for gains, but also huge potential for loss, are considered very risky. Most investments fall somewhere in the middle, with some potential for loss and some potential for gain. A decision about investment risk is very personal. You have to consider whether you would be more comfortable with smaller, guaranteed returns or the possibility of making great gains or taking great losses. Investing should not make you stay up at night, worrying about your choices. A good investment plan has a balance of risk and safety that allows you to meet your financial goals and be happy with the decisions that you’ve made. One thing that I think is seriously under-considered is how a TSP investment falls into your greater retirement plan. As a retirement savings tool, it is important to consider your other retirement savings tools when choosing how to invest your TSP money. Perhaps you expect to receive a military retirement and Social Security. A military retirement is an extremely safe, lifetime income that is adjusted for inflation. Therefore, you can assume more risk with your other retirement assets and still have balance in your overall retirement plan. On the other hand, if you are planning to leave the military after a few years and start your own business, you may want to invest your TSP contributions in more safe investments to offset the inherent risk in starting a business. For every situation, there is a balance of security and risk that makes sense and makes you feel comfortable. The default fund is the G fund, the Government Securities Investment Fund. If you do not select a different fund for your contributions to purchase, you will purchase shares of the G fund. The G fund’s objective is to avoid risk and produce a rate of return that will outpace inflation. The G fund invests only in specific, short-term U.S. Treasury security that is only sold to the TSP. Earnings come from interest income on these securities. The G fund will never lose money but it is subject to inflation risk, which is the possibility that inflation could grow faster than the value of the G fund. This would decrease the purchasing power of the money invested in the G fund. There are four index funds: the F Fund, the C Fund, the S Fund, and the I Fund. An index fund is an investment designed to match the performance of an index of a specific financial market. A stock market index is a tool for measuring the value of a portion of the stock market. Examples of stock indexes are the Dow Jones Industrial Average, the NASDAQ Composite, and the S&P 500. Each one measures the value of a certain sector of publicly traded stocks. Index funds are passively managed and do not change their holdings frequently. Each of the four funds offered by TSP attempts to replicate the index of a different sector of the stock market. The F fund is the Fixed Income Index Investment Fund. Its objective is to match the performance of the Barclay’s Capital U.S. Aggregate Bond index, which represents the overall U.S. bond market. It includes U.S. Government bonds, mortgage-backed bonds, corporate bonds, and foreign government bonds. Money is earned through the interest paid on these bonds. The F fund may have larger growth than the G fund, but it is subject to more kinds of risk. The F fund’s value moves with the bond market and, therefore, is subject to market risk. This means that the value of your investment may move up or down. In addition, there is risk of default, meaning that the issuing company or government could fail to repay the money used to purchase the bonds. The F fund is also subject to inflation risk, where the growth of the fund is smaller than the growth of inflation. Lastly, F fund investments are subject to prepayment risk, which is where the purchased bonds are paid back earlier than expected and the fund is forced to reinvest at lower rates. The F fund is right for you if you want to invest in bonds. The C fund is the Common Stock Index Investment Fund. Its objective is to match the performance of the Standard and Poor’s 500 (S&P 500) index, which is made up of stocks of 500 medium-sized and large-sized U.S. companies. Money is earned through the growth in value of the stocks, and also through dividends issued by the stocks. The C fund has the potential for larger gains than the G or F fund, but it is subject to market risk. Market risk is the rising and falling of the value of individual stocks inside the fund. C fund investments are also subject to inflation risk. The C fund is right for you if you want to invest in large, U.S. companies. The S fundis the Small Cap Stock Index Investment Fund. Its objective is to match the performance of the Dow Jones U.S. Completion Total Stock Market index, which is made up of stocks of small-sized to medium-sized U.S. companies that are not included in the Standard and Poor’s 500. Money is earned through the growth in value of the stocks, and also through dividends issued by the stocks. The F fund has the potential for larger gains than the G or F funds, but also subject to market risk and inflation risk. The S fund is right for you if you want to invest in smaller, U.S. Companies. The I fund is the International Stock Index Investment Fund. Its objective is to match the performance of Morgan Stanley Capital’s International EAFE (Europe, Australasia, and Far East) index, which is made up of stocks from around the world. Money is earned through the growth in value of the stocks, dividends issued by the stocks, and changes in currency valuation. The I fund has the potential for larger gains than the G or F funds, but is also subject to market risk, inflation risk, and currency risk. Currency risk is the potential for losses due to the rising and falling of the value of the US dollar versus the currency in which the stock is traded. The I fund is right for you if you want to invest in international companies. Traditional investment wisdom suggests that you should invest in more aggressive stocks and bonds earlier in your investment life, and gradually move towards more safe investments as you get closer to retirement. In order to make the process simple for investors who don’t want to make a lot of decisions for themselves, the TSP created Lifecycle funds (L funds). These funds use pre-determined investment mixes designed to meet specific investment objectives based upon the target retirement date. L funds invest in the G, F, C, S, and I funds. The funds are automatically rebalanced as the L fund moves closer to its end date. The L funds are subject to all the same risks as the individual funds in which it is invested. L funds provide a simple, diversified portfolio that requires little effort on your part. • L 2020, for people who plan to retire between 2015 and 2025. You are not required to choose just one L fund, and can choose a portion of two if you think that best represents your desired outcomes. The choice of TSP fund is very individual and should include a comprehensive look at your entire retirement income portfolio. However, don’t let analysis paralysis mean that you don’t start contributing. If you have to, just pick one and get started. You can always change your mind later, and making adjustments is quick and easy online. Withdrawals from a qualified retirement account are called distributions. There are federal laws that govern the distribution of money from qualified investment accounts. Make a single payment, or “lump sum” withdrawal. You will liquidate your entire TSP account and receive the balance in one payment. Any taxes due on a traditional TSP account would be calculated on the entire sum. Set up a series of monthly withdrawals. You can have this figure calculated on your life expectancy, or you may designate a certain dollar amount to be distributed each month. Either way, payments will end when the account is empty. Any tax payments will be spread out over the distribution period. Purchase a TSP annuity. An annuity is a contract to provide lifetime income to one or two people in exchange for an initial payment. Under the annuity option, the TSP uses your account balance to purchase an annuity from a private company. This is a permanent decision and can not be changed. Taxability of annuity payments depends on the taxability of the account whose funds purchased the annuity. Have any combination of the above. You must being taking required minimum distributions by the time you reach age 70 1/2. TSP has two different programs for accessing your TSP funds before reaching retirement age: TSP loans and in-service withdrawals. TSP loans can be used for any purpose. There are special terms and conditions if the loan is made for the purchase of a home. The money borrowed is removed from your TSP account. Repayments, including interest, are returned to your account. Repayment must be made via payroll deductions. If you leave federal service, your TSP loan is due in full and must be repaid within 90 days. If it is not repaid, it will be converted to a taxable distribution. In-service withdrawals are available to TSP participants who are currently employed, either in federal service or in the armed forces. TSP in-service withdrawals are only available for documented financial hardship, or TSP participants over aged 59 ½ may make one age-based in-service withdrawal during their life. In-service withdrawals remove the funds from your TSP account permanently and carry a variety of consequences, including tax issues and reduced ability to make subsequent contributions . I really love the TSP for its convenience, low costs, and many options. My only regret about TSP is that my husband didn’t start contributing more money earlier in his career. With a limited number of years to contribute, making a larger effort is important for building up a sizable account balance. However, even smaller savings can add up. Things change fast around here! Keep up-to-date with email alerts about the topics that are important to you! I don’t contribute to my TSP account but I know my company automatically give us 1%. In case of financial hardship do we have access to that money even though one doesn’t personally contribute? At 70!/2, do you recommend monthly withdrawals or an annuity? Ms. Ahearn, the answer will be different for every person and their overall financial plan. If you are unsure, you may want to meet with a fee-only financial planner to see which choices fits in better with the rest of your assets and income streams. Thank you for your reply. I chose monthly withdrawals after sorting through it all. I do regret that I can not transfer my ROTH to the TSP? I wonder why that had to be the ruling; one savings account as a federal worker to another seems congruent as a policy. I’ve started TSP about three years ago a total newb, I have two questions. On the TSP website, how can you tell if you’re losing money or gaining? Recession about to hit soon, should I put everything in G-Fund (100%) or 50/50 in G-Fund and L-Fund? 1. The easiest way to check if you are losing money is to simply look at the results for each fund you are in. If you want to make it super easy, on your account page it will have something that says “look at your 12-month PIP” or something like that. Just select that to see your performance over the previous year. I recommend looking once a month or less so as not to drive yourself crazy. 2. There is no way to know when the next recession will be. People started saying “the next recession will hit soon” on roughly the day the last one ended and they’ve been wrong ever since. They will eventually be right, but they are wrong wrong wrong in the meantime. The next recession could start tomorrow or 7 Jan 2027 and we really have no idea. Just decide on a long term strategy for your money, allocate it that way, and let it ride. People who jump in and out of funds because they think they can beat the market are statistically proven to do worse compared to people who never change anything. Not looking at your performance too often will help you keep an even keel.